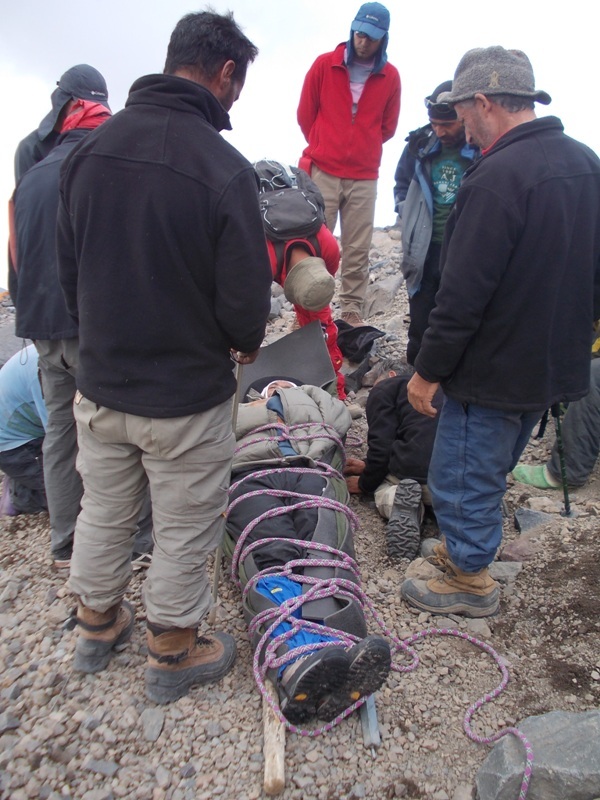 August 20, 2011 - While descending from the summit of Mount Ararat, this man slid 100 feet down a sheet of ice, above camp 2, and cracked his skull open on a rock. Tom Russell, an American climber who witnessed the accident, phoned Amy Beam, Mount Ararat Trek, and pleaded for a helicopter evacuation. After meeting with the Turkish jandarma and many calls to Agri and Ankara government offices, this was not possible. This man was not a customer of Mount Ararat Trek nor Murat Camping. However, Beam immediately enlisted her partners, Murat Şahin and Sayim Şahin, owners of Murat Camping, who organized a rescue team. The guide ran away to avoid jail, because the injured Armenian was climbing without a permit. The team of eight rescuers used the poles from the kitchen tent, along with mats and rope to make a litter. They carried the man for seven hours off the mountain to the waiting ambulance that drove him to Van Hospital. After a stay in the hospital, the man survived. This was a remarkable rescue operation, because it takes six hours for a physically fit person to walk off the mountain from camp 2 at 4200m to the pickup point at 2250m.